Describes how to set up lists which point to other sub lists. In this simple example we show how the selection of a type of frame or holder results in a second list showing the parts available for only that frame. In other words, each selection generates the name of the next list in order. For a detailed discussion of Lists in Cyrious seepricing_ch_06-selection_lists. The concept is to link lists so that the selection of one list then points to the next one in a series of drop-down menus. There is no limit to the number of lists you can link. These 2 screen shots show what we are building. The first is the pricing form showing the 2 selection choices. The second shows how the first list appears when selected. Create the lists which you intend to use. For the example here we have 2 lists. 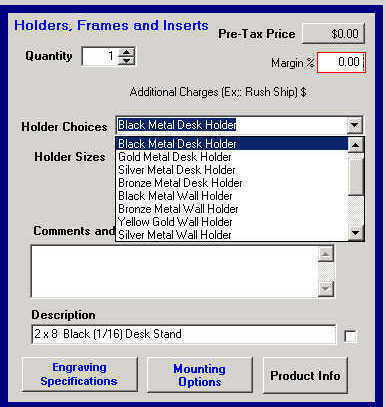 One contains a list of Wall Holders and Desk Stands for sign inserts by the color and type. The second list contains the sizes available for that color. 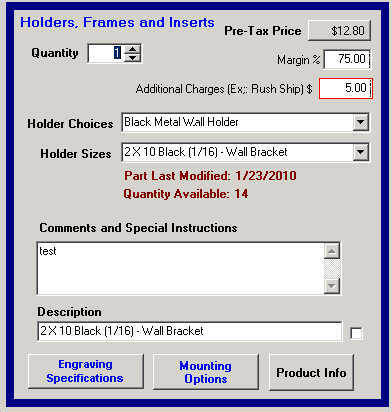 In the example below, the first list is the Holder Choices and the second list is Holder Sizes. For each row in your list you then select the next list you want your current list to point to by clicking on the Browse button and choosing the correct one from the drop-down selections. 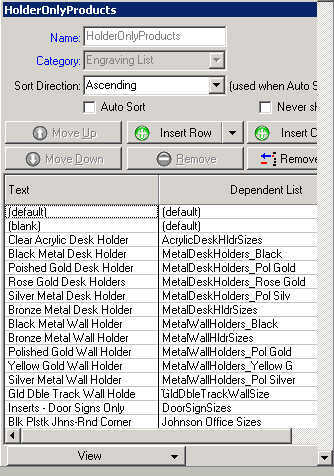 This screen shot shows the Primary list with the dependent list selections. Next you create a Variable to contain both lists and be sure to make the variable type - List. From the browse menu which comes up when you click on the Default List field, select your first list. 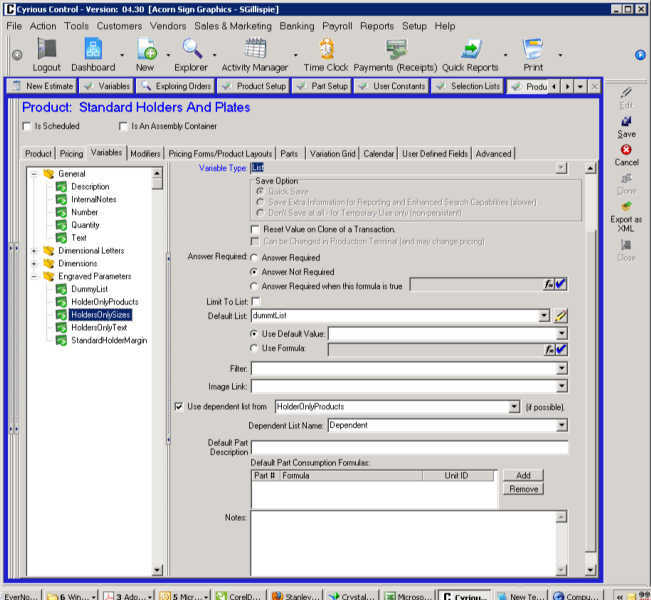 Next create a variable for the Dependent list, making the variable type a List. Since the list for this variable is determined by the preceding variable, you will also check the box “Use Dependent List From” and select the variable name of your first variable. The Dependent List name will default to “Dependent List” but if this is blank, click on it and Dependent List should be your only option. You can enter Dependent List directly into the field if necessary. In the screen shot below you can see how the Variable has been set up pointing to the Primary Variable and the name of the dependent list. Select and edit the product these lists will appear in and be sure they are checked or loaded in the Product.. Finally, assign the two variables you have created to the List Objects on the pricing form you are using for these selections. From an Order or Estimate open the pricing form of the product and your first list should then point to the correct dependent list.